Our Clear Checkbooks are a Heavy 12 gauge vinyl shell and are intended for TOP TEAR checks with die cut flaps for duplicate checks and a register. They can be used for side tear checks by using the duplicate flap. We also have Colored Checkbooks made from vinyl with a leathery 'look-a-like' and a bit smaller image. They are impressive but limited in availability. 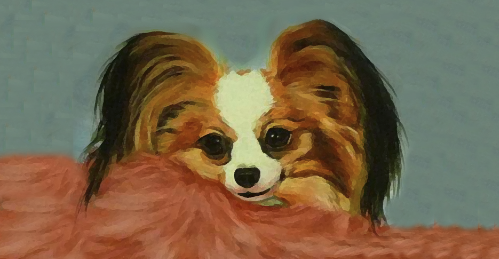 The majority of the wonderful selections of Papillon images are by artist Jill Riley of Jilly's Art. Great as gifts. Fabulous prizes. Can be customized free. We will never share any personal information with anyone for any reason. We take privacy extremely seriously. We want you to be happy with your purchase(s). We do our best to ensure your satisfaction. If you are dissatisfied for any reason, contact us immediately and we will do what's right by replacement, exchange, gift certificate, and/or a refund (my last choice 8o)).